Jonathan joined Cleary Insurance in September 2013. Prior to joining the Cleary Insurance Team, Jon worked in both customer service and sales where his primary focus was finding customer’s solutions to their insurance needs. 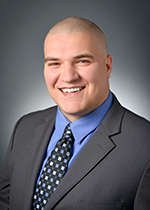 Jonathan currently holds his Property and Casualty Brokers License and is pursuing a Certified Insurance Counselor (CIC) designation.